Rice is a staple ingredient in Japanese cooking and can be served plain (unseasoned), or cooked and seasoned with other ingredients. 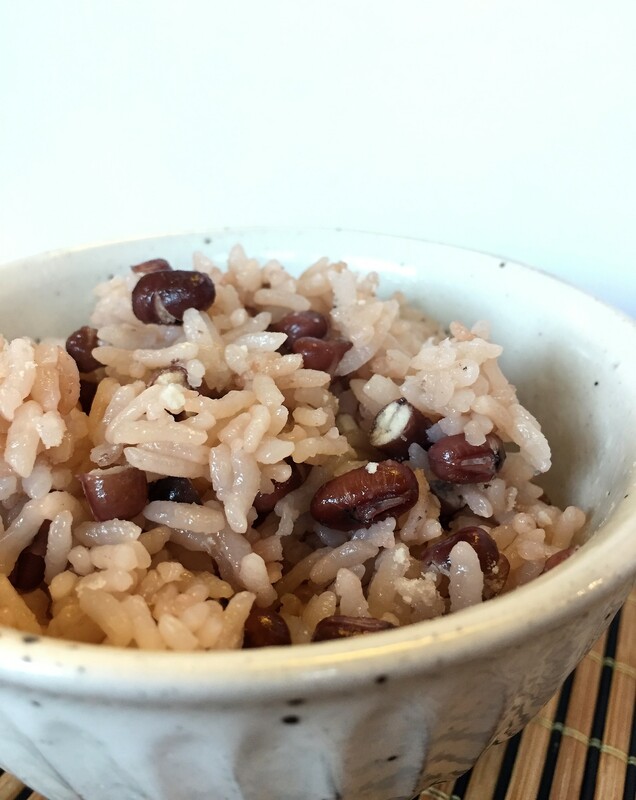 Azuki is sometimes cooked with sweet rice to make Sekihan, which is often served on celebratory occasions, but Azuki rice can be your everyday rice choice! Rinse the rice well in running water until the water runs clear. Strain rice and put it into an electric rice cooker or deep heavy pan such as a Dutch oven. Rinse and strain azuki beans. Cook them in boiling water for a few minutes and discard the water. Add clean water into the pan and cook azuki over low heat for about 1 hour or until the beans get al dente consistency (i.e. the center of the beans can be uncooked). Separate the beans and the cooking water. Save the azuki water. Combine the azuki water and plain water to make up to the 2 cups line in the rice cooker or add 1.65 cups of water to the Dutch oven. Add salt and azuki beans. Rice cooker: Cook the rice with azuki as you normally cook white rice. Dutch Oven: Cook over high heat to bring to boil, then put the lid on, turn down to simmer and cook for 12 minutes. Turn off the heat, with the lid on, let it sit for 15 minutes. Use a spatula to fluff the rice and toss it well with the other ingredients. You can sprinkle sesame seeds over rice and enjoy!